The "stay" command is an essential basic dog command that all dogs should learn. Almost as important as coming when called, the stay cue can prevent your dog from getting involved in dangerous situations. It will also allow you to keep your dog still and calm while you take care of household chores, entertain guests, or bring it to public places. This command training is not very difficult to achieve. You'll need to practice it consistently with your dog and should be accomplished in five- to 10-minute training increments, two to three times per day. A successful “stay” occurs when your dog does not move at all from the original position. When training, start with one to two second periods of staying and work your way up to several minutes. Before you begin, you'll want a dog collar, extra-long leash (15 to 30 feet if possible), and training treats that your dog loves. You can use this training on a dog that already knows the cues for sit and/or down. If your dog doesn't know these commands, go back and work on those commands first. 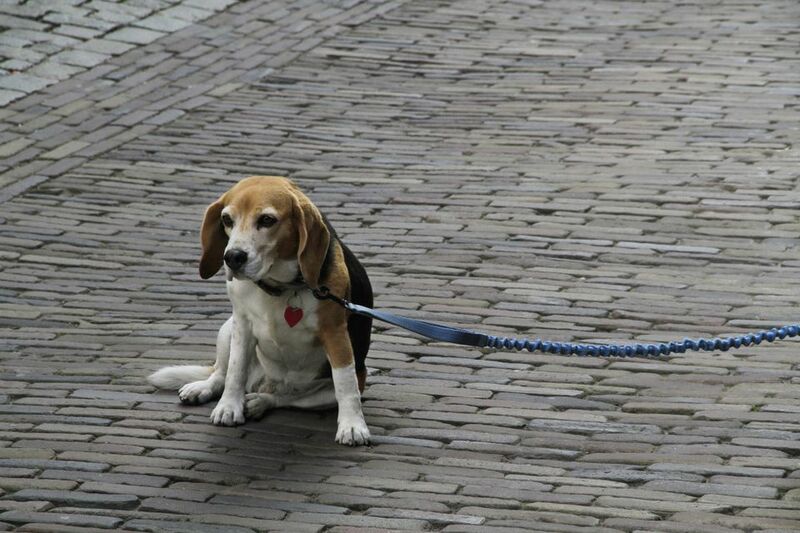 Place the collar and extra-long leash on your dog. Eventually, you won't need the leash for the stay command, but it's helpful in the beginning in case your dog doesn't stay. Also, putting on the leash and collar can become a ritual to indicate training will begin. Tell your dog to sit or lie down. If your dog is excited or fidgety, you may have more success starting with your dog in the down position. Say “stay” in a firm, clear voice while holding one hand up, palm out (as if to motion "stop"). If your dog does not move, give your pup a treat and praise. Release your dog from the command by saying “OK” and encouraging the dog to move. Instruct your dog to sit or lie down again and praise it when she or he complies. Say "stay" again with the hand motion while taking a step or two back. If the dog stays, walk toward it slowly. You may need to keep your hand signal in play. If the pup still stays, give it a treat and praise. If it moves, start over from the beginning. Repeat this process five to six times, gradually taking more steps back and increasing the time period between “stay” and “OK.” Once your dog can stay for 30 seconds or more at the end of the long leash, gradually begin to add distractions, change locations of the training, increase distance, and try leaving your dog's line of sight during the stay. Do your training in an area without distractions. If you don't have a backyard, a busy park is not a good place for this training, because there are too many distractions for the dog to focus on your commands. Try an empty park (go early in the morning) or ask a friend or neighbor if you can use a nearby yard for some peace and quiet. A common mistake is to assume your dog knows the command after a few training sessions and trust them to always follow it. Use caution with a newly trained dog. Keep it on the leash and don't lead the dog into a dangerous situation by relying on its ability to stay, especially in a place with a lot of temptations. Keep training sessions short and try to end on a positive note. If your dog cannot yet stay, then end the session with sit or something else your dog knows well. Once it seems your dog has mastered the stay command, try practicing with distractions like a squeaky toy or door knocks. Once your dog becomes an expert at staying, you no longer need to give a treat every time, only occasionally. Instead, reward with praise.